Polymers as coating materials were combined with quartz crystal microbalances (QCMs) to design sensor devices for the detection of both ionic and neutral analytes in liquid phase. The design and geometry of dual and tetraelectrode QCMs have been optimized to reduce electric field interferences. An unusual Sauerbrey effect was observed while exposing potassium salt solution to 10- and 20-MHz QCMs, i.e. increase in the frequency shifts by a factor of seven, which is attributed to electro-acoustic phenomena. Non-functionalized sol-gel materials were synthesized by templating with hydrophobic salt such as tetraethyl ammonium picrate. Imprinting with these ions of low charge density leads to sensitive layers, and UV–Vis spectroscopy was used to check re-inclusion of this analyte. In the next strategy, functionalized polyurethane for potassium ions and sol-gel materials with aminopropyl group as ligand were generated to tune selectivity and sensitivity towards Ni2+ and Cu2+. Methacrylic acid polymers were optimized for the detection of atrazine by hydrogen bonding; double molecular imprinted polyurethane approach was followed for pyrene recognition. Finally, these imprinted polymers were combined with tetraelectrode QCM to develop sensor platform. Dedicated to Prof. Reinhard Nieβner on the occasion of his 60th birthday. 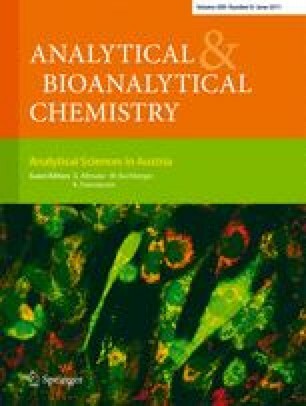 Published in the special issue Analytical Sciences in Austria with Guest Editors G. Allmaier, W. Buchberger and K. Francesconi. We would like to acknowledge the Higher Education Commission (HEC) of Pakistan for providing funding for Ph.D. studies to Adnan Mujahid, Usman Latif and Adeel Afzal.